Katherine of Aragon first captured my heart when I was deep in the research for my first Tudor novel, Dear Heart, How Like You This? When I finished that novel, I knew I just had to write about her, only to discover a writing road burdened with false starts and pit holes. 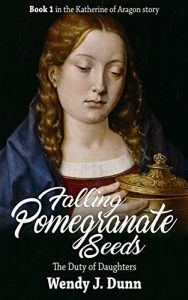 Very early on, I decided to use Katherine of Aragon’s personal symbol of the crowned pomegranate as my inspiration for the overarching title for the work: Falling Pomegranate Seeds, but I also realised I could only do justice to Katherine’s story by writing a trilogy. By 2008, I faced the frustrating fact my manuscript did not hit the bull’s eye. I could see why: I had chosen the wrong POV character for Falling Pomegranate Seeds: The Duty of Daughters. It was a dark time in my writing life; I had devoted years of my life to researching and writing of this work, only for it in fall into in the deepest pit hole possible. Well – that’s how I saw it then. Depressed about the thought of dismantling of my manuscript and starting again, I decided to be proactive and begin my Masters in Writing so I could apply for a scholarship supported PhD. I thought two years of study for my Masters would make me ready to return to rewriting Falling Pomegranate Seeds, but this time it would be my PhD artefact. But by the time I was accepted as a PhD candidate, another writing project had seized my heart. I wanted to revisit the last days of Anne Boleyn and seek for answers to questions left in my mind through the writing of Dear Heart. 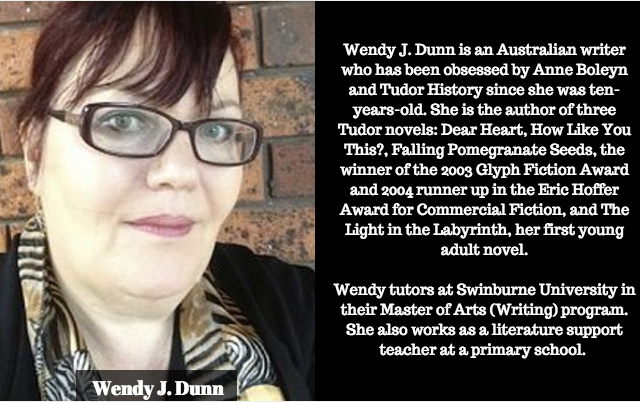 Thus, my second Tudor novel, The Light in the Labyrinth, was conceived and published in 2014, just before I was awarded my PhD. I’ve come to believe it is true there is a right time for everything. I always planned one day to get back to Falling Pomegranate Seeds, but that day did not arrive until late in 2015, during an email conversation with Tim Ridgeway of Madeglobal. I had contacted him because I wondered, and hoped, if he would be interested in translating The Light in the Labyrinth into Spanish. We exchanged a flurry of emails and Tim – likely trying to distract me in the kindest possible way from pursuing my original question – finally asked me if I had any other projects that may interest him. I told him about my planned trilogy about the life of Katherine of Aragon and how the first work focused on Catalina in her formative years. Time stood still for several heart beats. I quickly calculated the time I needed to pull apart and rewrite a whole novel. “Four months,” I lied. Knowing I had a publisher interested in my work, I then had to work out strategies to turn my lie into truth. I booked myself into Varuna, the Writers’ House, a very respected writing retreat in Australia, for two weeks in February, 2016 and then worked hard toward using those two weeks to completing my work. I knew I had an important, once in a lifetime deadline to meet, and I was determined to meet it. 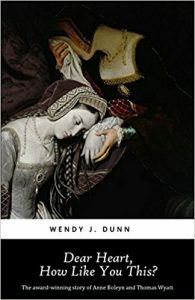 Falling Pomegranate Seeds: The Duty of Daughters, my third Tudor novel, was published by August, 2016, and I am now working on completing the second novel of my trilogy. So, what makes me so fascinated with Katherine of Aragon? 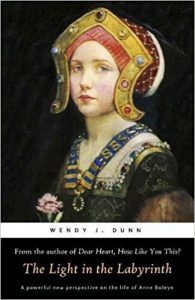 I have always connected to the stories of Tudor women because they provide explicit and inspirational examples of women navigating a patriarchal world. The life story of Katherine of Aragon provides a powerful example of a woman whose life is controlled by her gender, in a time when men determined the power permitted to women. I believe telling these kind of stories are important because they also cast light onto our world and how true gender equality is still a battle to be won. Born in December, 1485, Katherine was the fifth and last child of the marriage between Isabel of Castile and Ferdinand of Aragon. Intelligent, pious, educated by the best tutors her parents could find, her mother also ensured Katherine – like her four older sisters – was not lacking in domestic and ‘wifely’ abilities (Fraser 1998, p 12). Katherine was an excellent embroiderer, and would one day pride herself on the shirts she made for her husband, Henry VIII. Katherine was a royal daughter twice over and brought up in her mother’s kingdom of Castile, one of the most powerful kingdoms in Christendom. Her family did an amazing amount of travelling during the year – going from one royal home to another. Katherine even accompanied her mother and family to the battleground that saw the final major conquest of her parents’ Holy War – when the Moors were pushed out of territories ruled by them for centuries. One place important to Katherine’s early life was The Alhambra. From twelve to fifteen, she lived in this beautiful palace, which her parents had taken from its Moorish ruler. 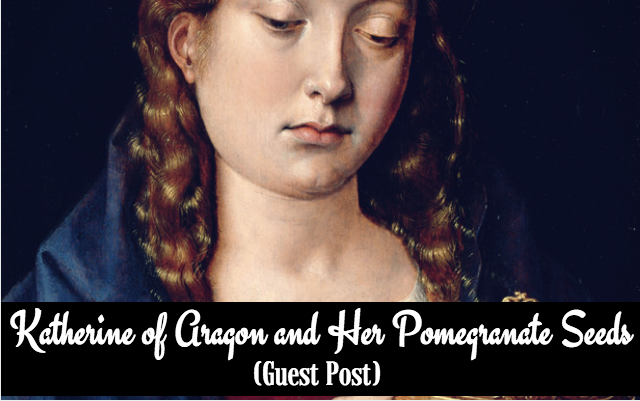 It was her final ‘home’ before she began her long journey to England, and the ending point for Falling Pomegranate Seeds: The Duty of Daughters. Katherine arrived in England just before her sixteenth birthday. The journey to England took months of travel – first overland, from Granada to the port of Corunna, and then a perilous sea journey, which saw her ship damaged and forced back by terrible storms. Henry VII, her future father-in-law and her intended husband Arthur first met her at the Bishop’s palace at Dangerfield in Hampshire (Fraser 1998, pg. 22). There – against all Castilian custom (a custom likely influenced by Moorish culture) – Henry insisted on lifting the veil of his son’s bride. He saw a pretty girl with a round face, possessing the grey/blue eyes and ‘rose’ complexion of her English ancestry; Katherine was descended from Catherine of Lancaster, the daughter of John of Gaunt. Katherine’s greatest beauty was her thick, long red/gold hair. I imagine, on this occasion when she first met Arthur and King Henry, her hair flowed free, as a symbol of her virginity. She was a tiny girl – no more than 1.5m (five foot) in height. King Henry and Prince Arthur expressed themselves fully pleased with Katherine, Arthur writing later about his joy at first seeing ‘the sweet face of his bride’ (Fraser 1998, p. 24). But Arthur’s happiness was short- lived. Within only a few months of marriage he was dead and Katherine’s own survival not yet certain. While there are other theories about Arthur’s death, it does seem most likely that they had both been stricken with one of those sudden deadly illnesses of the period (probably the English sweat), which struck fast and hard. After Arthur’s death, Henry VII and Katherine’s parents decided to betroth her to Henry, her husband’s eleven-year-old brother. King Ferdinand wrote, in 1503, ‘It is well known that the princess is still a virgin.’ But, in arranging Catherine’s betrothal, her father asked the Pope to write up the dispensation in a way that made the question of her virginity unimportant and would safeguard Katherine’s later marriage. Henry VII also protected his own child and son, not forgetting his political back: the marriage would only go forward when Henry the younger was old enough to agree to the match. Katherine endured seven dreadful years after Arthur’s death. Both Henry VII and her father treated her like a political pawn. After the death of her mother, which lessened her worth as a match for young Henry, and the death of Elizabeth of York, Henry VII often acted towards her like an utter miser. Poor Katherine was kept short of funds, as well as friends. Her own father mostly ignored her begging, heartbreaking letters, crying out for help. I agree with Antonia Fraser (1998, p. 56) that these years of deprivation shaped her in such a way that made it impossible for her to move aside when Henry VIII later sought to take a new wife. In that future time, I believe Katherine remembered her time of triumph after these seven years of hell as a widow; it was when Katherine’s faith in God was forged like steel, and unbending steel too. When Henry VIII wanted her to step off the stage and make way for Anne Boleyn, I believe Katherine thought all she needed to do was to keep faith and God would answer her prayers again. I also believe these years of great stress and deprivation impacted upon her health, perhaps leading to some form of kidney damage, which caused complications during pregnancy, making it difficult for her to bear living children. Weir’s Henry VIII, King and Court (2002 p. 10) and Tremlett’s Catherine of Aragon (pp 114 -115) also mention Katherine’s deep piety and habit of fasting – behaviours reinforced during her widowhood – may have caused reproduction problems. It is also possible her height was a factor too. 1.5m is a very short woman – and that can cause serious problems in pregnancy. Henry VIII was also 1.88m tall, far taller than Katherine. Big babies would have been hard for her to bear. Just before Henry VII died, a desperate and lonely Katherine swung between desiring death and contemplating taking the veil, but instead, with his demise, she married, after only weeks, his son, now England’s ruling King. Not long afterwards, she shared his coronation with him. During the early years of Katherine’s marriage to Henry Tudor, the English court had a reputation for learning as well as piety, probably stemming greatly from Queen Katherine’s encouragement of her husband’s better traits as well as her very own nature. Greatly respected for her intelligence, Henry had no hesitation in entrusting his Kingdom to his wife whenever he minded to go and do battle with France, his country’s traditional enemy. Katherine did her very best to provide Henry with a royal heir. She no doubt believed she had done her duty by giving her husband their daughter Mary, the only child of their union to survive infancy and live to adulthood. Perhaps if the fates had been kinder – if her husband hadn’t convinced himself that their marriage was accursed, and indeed no marriage after his hopes for a son had been dashed by the birth of another and yet another dead baby –Mary could have been a valid answer to the English succession. Overall, Katherine’s story is not a happy story; yet it is a story shimmering with all the light of a good life. Katherine had great nobility of soul, a woman who always tried to be a good queen – and England recognized that, and loved her. This is the woman I hope to bring alive in the next two novels of Falling Pomegranate Seeds. Weir, A 2002, Henry VIII: the King and his Court, Ballantine Books, New York. This is interesting to me. I am descended from this woman. I had seen a docu on Henry VIII that suggested the dead babies may have resulted from Henry’s bout with Syphilis. Forgive me, but how can you be descended from a woman whose only surviving child died without offspring of her own? Could be a sibling, cousin, etc, she is a descended from. Katharine of Aragon was one of history’s most mistreated women. I hope she has found joy in the next life.